MIDDLEBURY, Ind. — Coachmen has redesigned its larger Chaparral™ fifth wheel floorplans to incorporate a new mid-profile front end, along with a host of other user friendly features. The resulting three-quarter ton towable, mid-profile Chaparral is offered in 4 floorplans and available at very competitive prices. Entering the new Chaparral mid-profile is like stepping into a beautifully decorated home. Stand-alone furniture is featured throughout, providing a more homelike atmosphere that Coachmen designers amplified with raised panel cabinetry, designer window treatments and oil-rubbed bronze hardware. Owners can choose from three different fabric decors and two wood options. Spacious sliderooms make the Chaparral mid-profile living area roomy and comfortable. Adding to the spacious feeling is an optional skylight in the living area and large windows, including windows in each end of the slideout. In the process of redesigning the Chaparral mid-profile, Coachmen added two new and innovative floorplans. Each floorplan features three slideouts and purpose-designed layouts. One floorplan is the extremely family-friendly, dual bedroom 299TSB; the other, the 322RLTS, has wide-open living space for couples who like to entertain. The 299TSB is the right choice for families because it has two separate bedrooms and two bathrooms. In the front is the master bedroom with a queen bed slideout and a large walk-through bathroom. In the rear is the kids' bedroom with a bunk bed slideout and a second bathroom. This bathroom even has an entry door to the outside for those unexpected “emergencies”. The 322RLTS has an extra-large rear living area and galley that is expanded by double slideouts. A large entertainment center is built into one slideout, featuring 5.1 surround sound and a DVD player. A stand-alone bathroom provides total privacy, and a side aisle gives easy access to the spacious bedroom. One of the most noticeable changes to the Chaparral mid-profile is the all-new fiberglass front cap. The new cap is more aerodynamic to help improve gas mileage and towing performance by reducing wind resistance. Coachmen also engineered notches in the front cap that allow up to a 90-degree turning radius, even with most shorter bed pickup trucks. This makes Chaparral very maneuverable in tight spots at campgrounds and service stations. Coachmen made sure that properly equipped three-quarter ton pickups can tow these fifth wheels. Another easy touch is the addition of the pin-seeker mirror system on the front, making it easier for a driver to back a truck up and engage the hitch. 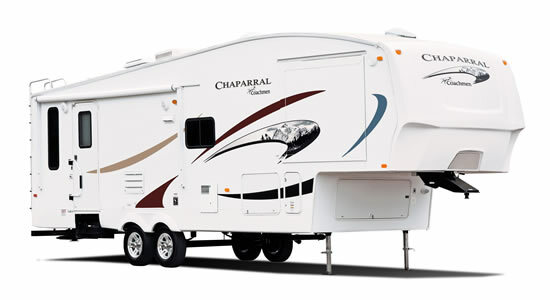 Coachmen equipped Chaparral with huge pass through storage, up to 45 cubic feet; and a standard, new exterior bicycle rack that pulls out from under the bumper. It can hold up to four bicycles. Other features that make Chaparral attractive are the exterior speakers for those who want music when they sit outside and the optional stainless steel portable grill. Coachmen’s exclusive Water Works™ utility panel allows owners to perform key water functions, such as filling, draining and winterizing, with the turn of a single handle. This is much easier than the panels that require switching multiple valves to accomplish the operation. Another distinguishing feature is the black tank flush that makes for easy cleaning of the black water tank after it has been emptied. With an MSRP beginning at $32,510, these mid-profile fifth wheels are both attractive and affordable. Coachmen Industries, Inc. is one of America’s leading manufacturers of recreational vehicles, systems-built homes and commercial buildings, with prominent subsidiaries in each industry. The Company’s well-known RV brand names include COACHMEN®, GEORGIE BOY™, SPORTSCOACH®, ADRENALINE™ and VIKING®.